I have tried other Strawberry Jam recipes in the past but I always return to the easiest one I have ever made because it really does taste the best. I learned to make this easy strawberry jam way back in my middle school years from a Better Homes and Garden cookbook that I was required to have for Home Economics class. It just goes to show that sometimes it is just better to stay with the simple and tried and true recipes that have been handed down from generations. And if this is going to be your first adventure in canning and making a jam then try the easy recipe first. Once you have the hang of it, you can get a little fancier if you want. Wash your strawberries and remove the stems, slice them lengthwise or quarter the larger ones. Place 4 cups of the berries in a large saucepan and add 1 cup of the sugar. Mix it carefully and let it stand for 15 minutes. Now add your remaining sugar, mixing it well. Bring the mixture to a full rolling boil and boil hard for a full minute. Stirring constantly. Ladle into hot scalded jars and seal at once. There is no need to do the hot water bath because your jars were already hot. Store in the pantry until you are ready to use. Refrigerate any opened jars of jam. Jellies are made from fruit juice with no whole or partial fruits in them. They are smooth and clear. A marmalade is a jelly that has tiny bits of fruits added to it. Jams are made from the pulp of a fruit or crushed fruit. They will not be as firm as a jelly but will have a nice bit of pulp and texture to them. A conserve is a jam that has two or more types of fruit and nuts or raisins. Preserves have chunks of fruit in a syrup or jam. They are a thick spread with pieces of the fruit visible in the mixture. I think if we get technical on this recipe it is more of a preserves than a jam because the cooking process gives some pulp but there are some nice chunks that remain of the berries, too. We love putting it on toast but have also been known to put some on ice cream from time to time. So, you can call it Strawberry jam or Strawberry preserves but I think what you will mostly call it is delicious! Give it a try and come back and let me know if you liked it or not. June in Indiana brings us fresh spinach if we planted it and if not we can find some nice fresh leaves at the local farmers markets. I love fresh spinach to eat in salads or to cook with! A nice spinach salad is often my choice at lunch time. As a kid, I had to eat a lot of spinach because I was anemic and it was a great natural source of iron. My Mom (bless her heart) was not so great with her cooking creativity and usually gave me canned spinach which was pretty awful. As I began to mature and started creating my own meals, I found that fresh spinach was awesome in a salad. I actually prefer it over lettuce most of the time. With a whisk mix together the soy sauce, rice vinegar, brown sugar, chili garlic sauce and oil in a bowl. Add the mushrooms and toss them to coat them with the liquid. Let them marinate at room temperature for 2 hours. Toss it a few times while it is marinating. Drain the mushrooms and save the marinade. Toss the spinach, corn, avocado, carrot and onions in a bowl. Now add the marinade and toss it again to coat everything. Serve the spinach in individual bowls . Top with extra mushrooms and sprinkle with the toasted sesame seeds. Place your fresh spinach in a plastic bag and store in the refrigerator. You should plan to eat it within three days. Fresh spinach is usually kind of gritty so rinse it thoroughly before you use it. Do not rinse it before you place it in the bag, though. Another thing that is or will be soon ready to harvest in our Indiana Gardens is strawberries. Have you ever had a Spinach salad with strawberries? Oh my goodness it is so good! The recipe that I like the most right now is the one that Rachael Ray has on the Food Network. Rather than trying to recreate the recipe, I am just giving you the link to their page because I can’t improve on her recipe. I just know that I really like it. The image to the left is her picture of her recipe, too. June is the beginning of being able to harvest some of our garden plants and I think it is so exciting every single year. There is just something so rewarding from being able to cook with the items that you have grown yourself. Also, we know for sure what was used or not used on those plants and do not have to worry so much about harmful chemicals and agents that someone else might have used. If you do not have a large garden or use containers for your gardening and there are plants that you just couldn’t grow because of limited space, do not fret. Visit those local farmers markets that are usually open on Fridays and Saturdays. They will begin to have produce that has been locally grown and ready for you to take home to enjoy with your family. Never be afraid to ask where the food was grown and if they know whether it was grown organically or not. My rule of thumb is that if they say they don’t know or they hesitate in giving me the information, I can decide to go to the next stall and purchase from someone who is willing to tell me. So much of what we grow can be used in a salad like the spinach that I have talked about here in this post. Since our harvesting is just beginning you might like to get yourself a good cookbook that has salad recipes in it. I recommend the Super Salads: More Than 250 Super-Easy Recipes for Super Nutrition and Super Flavor. It has so many wonderful recipes to try and covers virtually every kind of plant that is grown in a garden. In an earlier post I talked about the horseradish plant and the benefits that this spicy root can have when added to our diets besides it just tastes so darn good. I had promised that I would give you some recipes to use once you have harvested some of the roots. So, here I go giving you some ideas on how to use the root other than buying it in a sauce in the grocery store. (Which by the way there is absolutely nothing wrong with!). And now without further ado….the recipes. Grate the apples and moisten them with vinegar. Add the horseradish and paprika. Thin to the desired consistency with the wine. Boil potatoes until tender. Drain well. Add butter, cream, and horseradish, then mash well. Add salt and pepper to taste. Make Your Own Sauce – It is really easy! The guy in this video shows us just how to do it! You can also use horseradish as a topper on vegetables and in salads as a substitute for butter and salt. 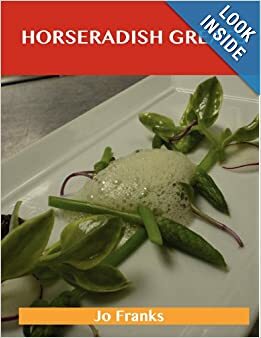 I think you will have fun and really enjoy these recipes using the horseradish that you grew in your Indiana garden or purchased in the produce section of your local grocery store. Of course, being a gardener, I prefer growing my own but if space for you is limited there is nothing wrong with buying a root and using it in your recipes. I love baking and I also love watching Duff Goldman on the different programs that he is involved with on the Food Network channel. Imagine my delight when I found this cookbook with his recipes in them! I am always fascinated with his artistry when it comes to decorating cakes and also his down to earth personality. The kids shows that he helps host are just delightful and I love how he works with children. So, one of the items that I plan to ask for when my birthday rolls around is the baking cookbook by Duff Goldman. The cookbook offers over 130 different recipes that are not just artful cakes. Duff is actually quite a good pasty chef who happens to excel in cake decorating. 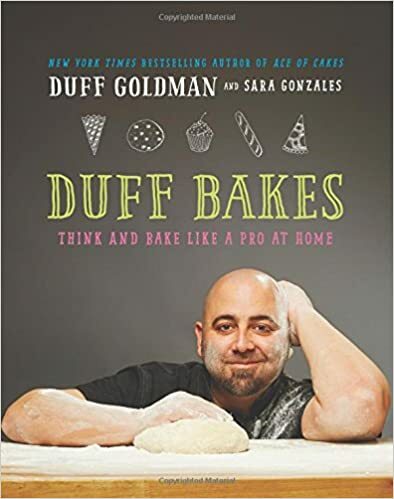 In this cookbook we can learn the skills of baking breads, pastry doughs, muffins, cookies and so much more from Duff. I noticed that one of the recipes is for bacon jalapeno biscuits. Now that sounds like a savory treat that both my husband and I would enjoy! I think that is one reason that this particular book appeals to me, it isn’t just about baking desserts. You and I will find some recipes for other baked items as well. Another feature about this book is that it is available in hardcover which is what I prefer for my cookbooks and also in digital form for those who prefer reading their recipes from their mobile devices. Being able to access his recipes from your tablet or phone is a real convenience if you happen to be away from home or do not have room to store several cookbooks. I am really hoping that one of my girls will get choose this as one of my birthday gifts this year. I am pretty sure with the help of Duff, my baking will take on a new level. The author may receive a small commission when items linked to are purchased from this article.